Your Holiness, what would you say to the Western "Buddhists" for whom the Tibetan political issue is completely distant from the religion, which they have so enthusiastically adopted? (lively and with determination) � Oh, that is wrong! Tibetan freedom is very much linked with the Tibetan Buddhism. Without Tibetan freedom, the Tibetan Buddhism cannot survive. Ewa Kedzierska: Your Holiness, before the Chinese invasion in 1949 Tibet was an independent country, with more than thousand years of history. We have eye-witnesses saying how much it has suffered under the Chinese occupation. Many Tibetans, as Tibetan Youth Congress, and also those from Tibet, want independence back. Your Holiness, why are You seeking only autonomy, and not independence? Do you believe that the policy of Tibetan Government in Exile (TGIE) really represents views of the Tibetans in Tibet? What is Your approach to the more radical Tibetans? H.H. 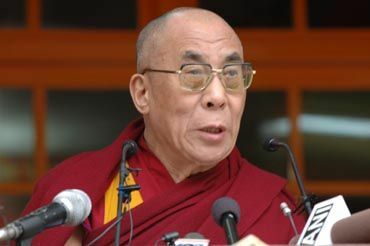 the Dalai Lama : - Our administration (TGIE) here is in a free country, and therefore I think, it can act as a representative of the majority of the Tibetans in Tibet. But those in Tibet who think realistically, most of them, agree with our approach, the policy of Middle Way, and support it. As far as the Diaspora is concerned, since 6 years we have full democracy, and my own position is that of a semi-retired. Our elections are every 5 years, and the Prime Minister Prof Samdhong Rinpoche was elected twice (2 terms of 5years) directly by the Tibetan people. Of course, for the next term a new person has to come, so let those, who have a different approach than ours, like the TYC make clear about their ideas and contest the elections and win. Then, majority of the Tibetan people, at least in exile, will decide want they want. But of course we appreciate these different views, different opinions; we are totally committed to democracy, to freedom of speech, freedom of thought. Then, the main reason why we are seeking the solution within the Chinese constitutional framework is that Tibet, as a vast land, rich of the natural resources in the past completely neglected modern education, technology etc� and was materially completely backward. Yet every Tibetan wants modernisation. So therefore it is our only interest to remain within the PRC. If they give us the meaningful self rule or autonomy, so then we can realise the material development with their help, while, at the same time, preserving our spiritual and cultural heritage and language. So there will be a mutual benefit, mutual interest. Of course, when more time pass without any concrete result in talks with the Chinese, it engenders more criticism and the frustration increases, so - we will see what will happen� (laughs). I think it is time the Tibetans reclaimed their holy land through non violence by sincere prayers, devotion, meditation and sacrifices from the heart. This will enable the heavens to look upon humans as the gentle people we used to be and they will help fufill the long wishes. As for the occupiers I can only see that it is a matter of time that the communist breakup is inevitable. I hope and pray with the Tibetans and all those peaceful people of this earth that this glorious moment will come.